It is nearly that time of the year, when folks from all over the Interwebz decide to post their Best of 2014 lists. 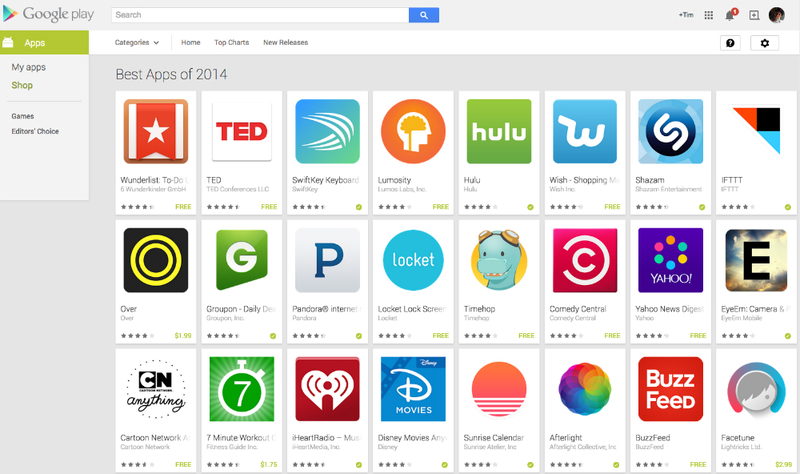 While we work on ours, including best phones, tablets, and accessories, and apps, Google Play has busted out their list a bit early, laying out the best apps of 2014 available for Android devices. There is a total of 75 apps on the list, which seems over the top, but Google feels you all need these apps, so we can’t look away from it. While some of the apps are certainly download worthy, others seem not-so “Best of 2014,” such as SoundHound, OkCupid Dating, Groupon, and Hulu. The list also features a ton of indie developer applications, all of which definitely deserve their place on this list of top 75 apps. How this list was curated is unknown, but it could be based on trends, gross downloads, ratings, and a variety of other factors. As for my opinion on this list, I think it’s missing a few big names. I would add Inbox by Gmail, Star Walk, SpinIt Live Wallpaper, UpTo Calendar, and a few more. And just to note, this is not a Games list, which will undoubtedly come a bit later. Go take a peak at the list and see what you think. Motorola Cyber Monday Deal is Live! $359 for a Moto X (2nd Gen)!